I'm not sure how a developer goes from a coming-of-age adventure story about a teenage girl with the ability to rewind time to a post-Great War action-RPG featuring a vampire doctor caught up in the midst of the Spanish Flu. But such is the path that Dontnod Entertainment, the developer of Life is Strange, has taken for its new game, Vampyr, and I would be lying if I said I didn't dig it at least a little bit. That's based more on hope and relentless optimism than actual information, since Dontnod really hasn't said or shown much about the game up to this point. Even the website at vampyr-game.com is basically a placeholder. 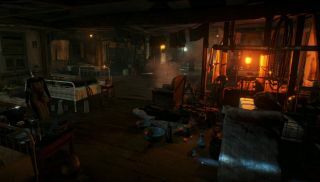 But today the studio released four new screens showcasing its London-based environs, and they are... well, they're really dark. But this is a game about vampires, after all, and we all know they only come out at night. And it's not like the world was all that well-lit 100 years ago anyway. It's still not much to go on, but I really do like the shadowy ambiance, and especially that shot of the early 20th century hospital, which looks to be all the right kinds of unpleasant. (Which is to say, "very," but not something I have to deal with.) For now, it's certainly enough to keep me interested. Vampyr is currently slated to come out sometime in 2017.